The cover of Jeff Stein's book on Iowa's 2008 flood. An anniversary is a commemoration of the date something notable took place. But it’s not necessarily something folks celebrate. June 2010 will mark the second anniversary of the massive flooding that devastated much of Iowa and parts of other Midwestern states. But no one will be celebrating. Beginning June 7, 2008, floodwaters ran in portions of Iowa, Illinois, Indiana, Minnesota, Missouri and Wisconsin. Thirteen people died, and damage was in the billions. In Iowa, the central part of the state and Cedar Rapids were hardest hit. Two people lost their lives. 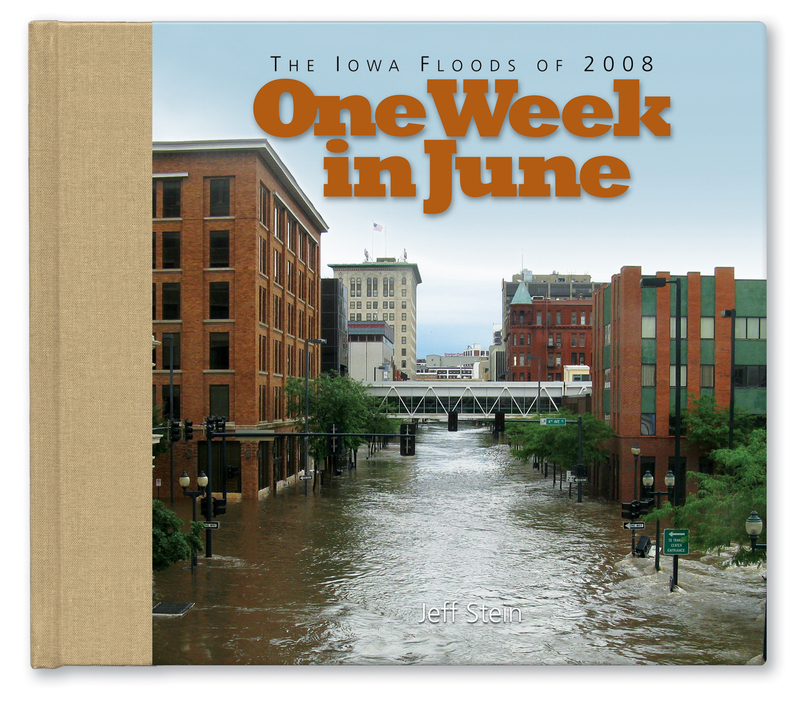 A comprehensive new hard-cover book, “One Week in June: The Iowa Floods of 2008,” chronicles the flooding along Iowa’s Cedar and Iowa rivers. The book was written in documentary style by my friend, Jeff Stein, who is professor of communication arts at Wartburg College and the executive secretary of the Iowa Broadcast News Association. WDG Publishing of Cedar Rapids, whose offices were among those flooded, is the publisher. The book can be ordered for $44.95 plus shipping and handling by calling WDG at (800) 626-0411. It also is available from Barnes & Noble and other stores throughout Iowa. More information about the book and a sample chapter are available online at http://www.JeffStein.org. The 144-page book contains more than 200 color images from the communities affected by the floods. Breathtaking aerial shots in particular illustrate the widespread devastation. The pictures and Stein’s narrative encompass the disaster of the Cedar River Valley and form a chronological and geographical look at the Cedar River’s destruction from Charles City southward. Flooding of the Iowa River in and around Iowa City and Coralville is also included, as well as the aftermath in communities south of the confluence of the Cedar and Iowa rivers. When writing the book, Stein said people didn’t want to talk about their experiences because no one thought what they did was anything special. Many say the flood of 2008, coupled with some deadly tornadoes, will be remembered as the worst natural disaster ever to hit Iowa. Our governor, Chet Culver, also has predicted the disaster is likely to go down as one of the top 10 worst natural disasters in United States history. Time will tell. Copyright 2009 by Phil Roberts, Creative Enterprises. Submitted as an “Everyday People”column at The North Scott Press. 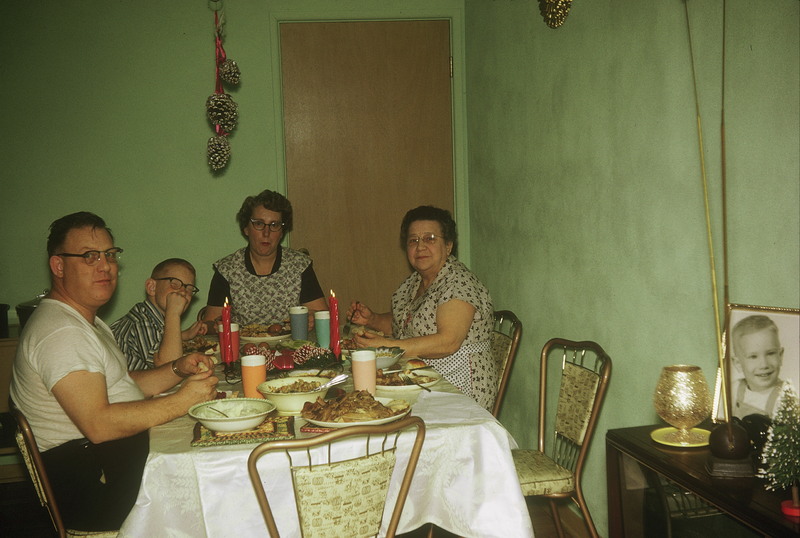 Christmas dinner 1963. Shown left to right are Dad (Ray), brother Bruce, Mom (Dorothy) and Grandma, my dad's mother, Grace Roberts. I was the rookie photographer who took the off-center picture. 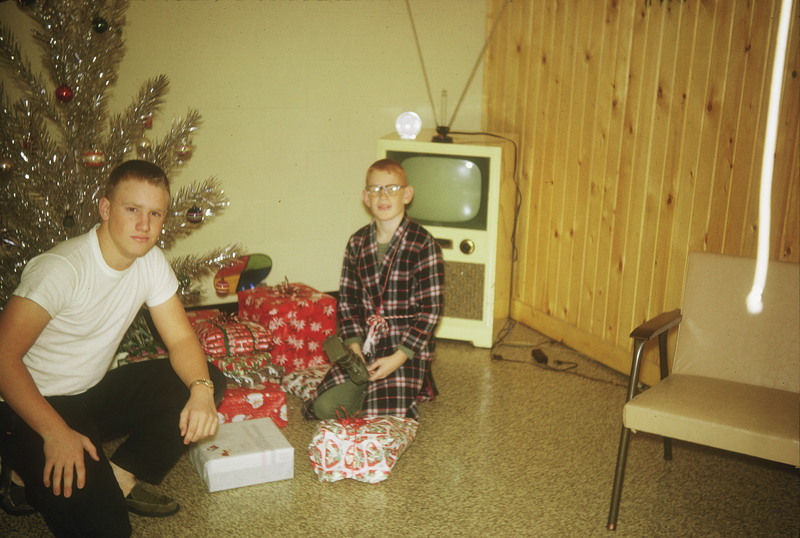 With my brother, Bruce, at Christmas 1963. We're in the basement because our dad so loved Christmas he often put up two trees, one in the living room and one in the basement family room. He also took this picture. I must have trained him how to do it off center. There are many reasons. Among them are the true reason for the season, the joy one feels when giving to others, the “peace on Earth, good will toward men” feeling that comes over many of us, the fun of having family and friends around more than normal, the beautiful decorations and lights, the special holiday music and, yes, the festive food. A big part of Christmas for me is watching classic Christmas movies between Thanksgiving and Christmas Day. And I know I’m not alone in this endeavor. I recently posed this question to my friends at Facebook.com: What is your must-see Christmas movie or movies over the holidays and why? As for me, Christmas movies that have won their way into my heart, in no particular order, and the reason why are “A Christmas Story,” I can relate a bit to that family and those times; “It’s a Wonderful Life,” I find it uplifting every time I watch it, and I’d like to think we all have a guardian angel like Clarence watching over us; National Lampoon’s “Christmas Vacation,” I love the interaction between family members, particularly Clark Griswold and Cousin Eddie Johnson; and “Home Alone,” the way a youngster outwits two bumbling would-be burglars is hilarious. To my readers, merry movie-watching and Merry Christmas! Copyright 2009 by Phil Roberts, Creative Enterprises. Much of this piece was submitted to The North Scott Press, Eldridge, Iowa, as a column. 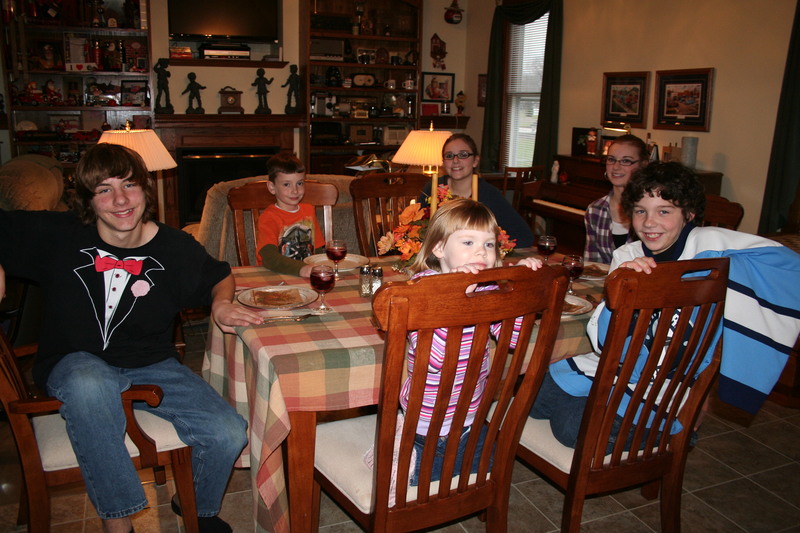 The grandkids (six of seven of them; Emaline is a newborn and couldn’t make the trip yet) at dinnertime on Thanksgiving. Dinnertime on Thanksgiving. We all have many blessings. …..I’m amazed. Yet another public figure is accused of marital infidelity. Lots of it. And, like those before him, he apparently thought he could get by with it. Half a dozen women have now come forward alleging they’ve had affairs with golfer Tiger Woods. It appears he was working on more than his golf game in his free time. Don’t you wonder how long this would have gone on had he not had his car wreck? Will he make the standard public apology to his family and fans like so many public figures do, with his devoted wife standing by her man? Also, why haven’t all of the companies whose products Tiger endorses — like Nike and Gatorade — dumped him already? …..I think a person can be both polite and assertive at the same time. I remember how a few years ago I was glued to the TV when there was a knock at the door from two Jehovah’s Witnesses. I’m an NFL fan, and there was less than a minute to go before kickoff at the Super Bowl. I opened the door, saw who the visitors were and said something like this, “I’m a Christian, I’m happy with my church and the Super Bowl starts in seconds. Have a nice day.” With that I closed the door and hurried back to my LaZBoy. …..I’m pleased that Eldridge Mayor Brad Noel decided to complete his term and has received a good deal of support and encouragement from many folks as he works through some personal problems. Sure, his difficulties have no doubt been a distraction for him. But I’ve known Brad for a long time and have never once thought he’d let his troubles get in the way of serving Eldridge to the best of his ability. 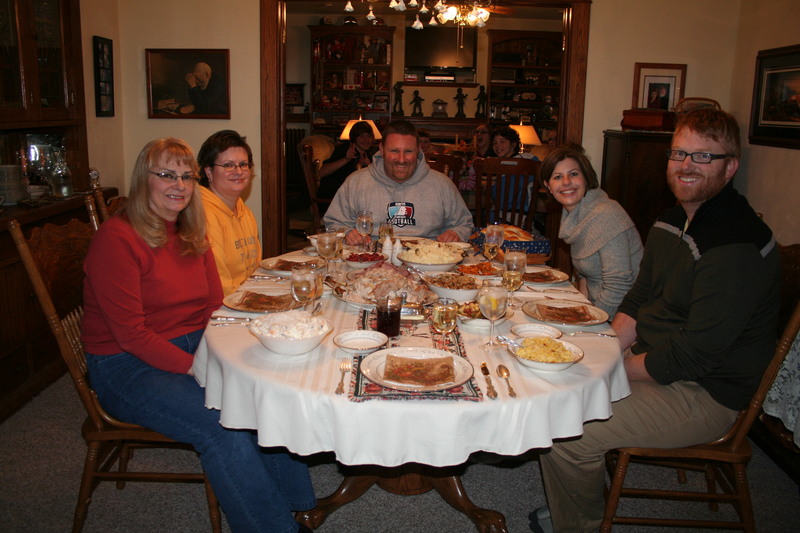 …..The older I get, the more Thanksgiving means to me. Sure, we all have problems. For many of us, they are just little bumps in the road. For others, they are serious concerns. But we all need to gather with family or friends at least one day a year to remember how many blessings we also have. My wife came up with a neat idea a couple of years ago. At our prayer before dinner as we sit around the table, we all join hands and each person says aloud one thing he or she is thankful for. …..Every time I read in the paper about another juvenile delinquent getting caught for some misdeed, it occurs to me that school districts need to let teachers drop that boloney about treating little Johnny with kid gloves so as not to damage his self-esteem. I think we need to forget about self-esteem some and let little Johnny know the difference between right and wrong — and that there are consequences for doing wrong. True, teachers shouldn’t have to teach discipline, but some parents certainly aren’t getting the job done. Copyright 2009 by Phil Roberts, Creative Enterprises. This “Everyday People” column appeared in The North Scott Press, Eldridge, Iowa.